Creative Contracts is a Cape Town-based firm that serves the relationship between the employer and employee on a growing number of South African citrus, berry and vegetable farms, where the temporary labour force is often vulnerable and semi-literate. “If you as an employer want a good relationship, it doesn’t make sense to give a contract to a person who knows that you know that they’ll have trouble understanding the legalese, because there’d be no moral foundation to be committed to the content of that agreement,” says Robert de Rooy, the lawyer and pioneer of the comic contract, a legally binding document in words and pictures. A contract is just information that needs to be understood, he points out, and there is no reason why it needs to be dense, impenetrable text, especially when aimed at employees who are not functionally literate or even illiterate. 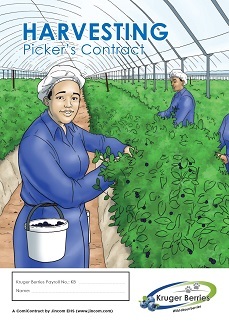 With the support of ClemenGold, Creative Contracts drew up the very first of their comic contracts for citrus pickers and packhouse workers in May 2016. They have since done the same for others, like Hayshed Farming in the southern Cape, Rora Orchards in the Western Cape and Kruger Berries in Limpopo, as well as for the South African wine industry’s Wine and Agricultural Ethical Trading Association (WIETA), and there is interest from other large citrus companies. Their contract is endorsed by SIZA (the Sustainability Initiative of South Africa) and anecdotal evidence from producers is that the introduction of this type of contract relaxes the atmosphere in what can otherwise be a tense situation and reduces the induction time of new employees. One of the matters that they’ve wanted to put across is that employees are entitled to compassionate leave, as long as they communicate timeously with the employer and not merely stay away from work. Other factors like the employment requirements, hours of work, payment as well as health and safety feature in the contract. For some of their clients they’ve provided an electronic certificate solution with a link for the employees to access the contract online, as well as sending an SMS with this link, so that employees can consult the contract at any time. They are supported by the Hague Institute for Innovation of Law (HiiL) and the German government through the GIZ. HiiL recently facilitated a visit in Uganda with a view of serving the relationship between the many smallholder coffee farmers and coffee buyers, through improving cultivation practices, thereby coffee quality and ultimately farmer income. Their concept is not limited to the agricultural sector. It is suitable to all industries where the work force meets the profile of vulnerable, often temporary and semi-skilled labour. They’re far along with a project to introduce creative contracts between schools and parents in economically deprived areas of the Western Cape, in conjunction with the Sustainability Institute of the University of Stellenbosch. 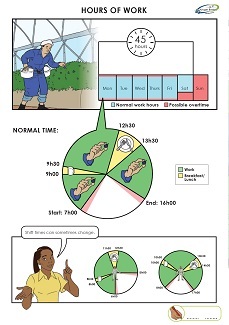 This would be directly applicable to South African farms, which often provide crèches to employees, as well as to farm clinics by presenting medical consent forms in this way. Other possible applications are for non-disclosure and rental agreements.